Fashion in the 80s was full of colour as new wave washes away the fashion debris left by disco. Neon is the newest color of the rainbow, designers get crazy with jeans, and legs everywhere are getting warmer. Put on a headband and get physical, ’cause the metal is getting heavy and the spandex is getting tight. The 80s decade is all about you. And by you, we mean ME. This entry was posted in Fashion and tagged 1980 by Skooldays. Bookmark the permalink. Hey Skooldays! 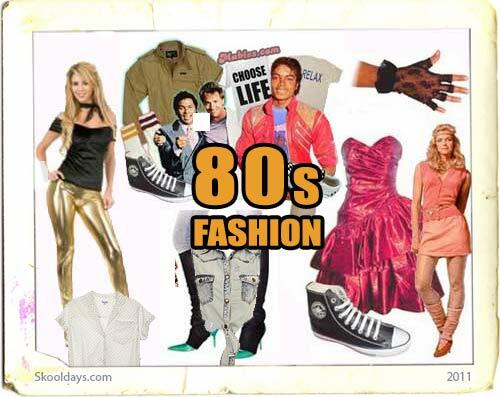 We share your passion for 80’s fashion. However the image you have up there was created by us, and is not available for use on other websites. Please remove it from your site. Looking forward to seeing what you create in it’s place. Peace! A shame to have to loose the potential traffic of our 80s fans – Are you sure you want it removed as all publicity is good publicity?